Okay, the first lesson went well. During the wrap-up your voice teacher complimented you on a good job and told you to go home and practice. You dutifully promise to practice, but the truth is that you may have no idea at all what to do first, or second or even next. So it’s highly likely that you’ll waste hours singing along with your favorites over and over again—making the same mistakes every time. Old habits don’t die easily. Together, you and your teacher must convince your body that it is okay to accept strange new sensations and positions— even, perhaps, a new way of breathing. This involves a serious commitment of time, energy and laser-like focus–also known as discipline. Set a convenient time and place, put a Do Not Disturb! note on the door. Record your practice sessions on your cell phone so you can listen back for accuracy. If you practice scales by singing along with the piano, you are missing out on a splendid opportunity to strengthen your ear training. Try this: Play your starting note of the scale on the keyboard before beginning and then again after your landing to listen for vocal accuracy. When you encounter an especially difficult passage or a note that is troublesome, break it down into small units. Work outward from the core. Don’t start on the part that’s giving you trouble. Start before then and loop the trouble spot. Looping is a cinematic term that means repeating tightly, i.e., “the dog jumps over the couch”; “jumps over the couch; jumps over the couch.” Be absolutely certain you don’t insert any space at all between the finishing word and the next repeat. 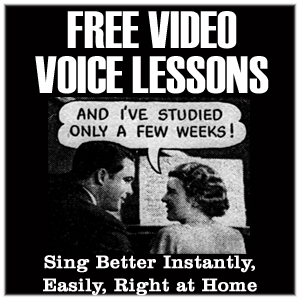 Above all, resist the urge to learn your music by singing along with the artist on the record or demo. You’re at risk of dropping behind the beat instead of leading with your voice. Here is another bit of magic you should try. When you are learning new material, thoroughly learn the melody, the rhythm, the lyrics and the cues. Then sing the song at warp speed several times—until you feel you “own” the song. This also works in reverse. 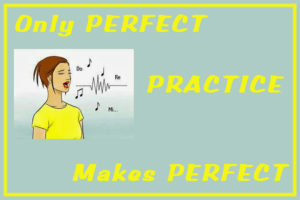 By slowly drrrrr-aa gg-ing it out, you will better understand the elements that make up the music you sing. Successful rehearsals are as much about social skills as they are about musical skills. All basic rules of courtesy apply. Show up on time and show up prepared. Do your homework; rehearsal is not the time to practice; do that at home. Keep your equipment and instrument (s) in good working order. And if you’re going to be critical of your rehearsal partners, you had better be the best musician in the room! In the following video Jillian Kohr and I discuss practice. I hope you’ll listen in and leave a comment in the comment section below.